I am proud to report that my picture “Gesaeuseeingang” won the “Landscape” category of the “10 Years Nationalpark Gesäuse” photography competition. In the evening of October 27, 2012, the winning pictures were presented in Admont, at the Spirodom hotel. On top of that, in the same category, Andrea and I also won the prices for the second and third place. It was a really weird experience when they handed the prices over to us :-). Unfortunately Andrea’s picture is not available online, so I cannot link to it. But you can find a description of my second picture in my post “Timeless” Won the Second Place. 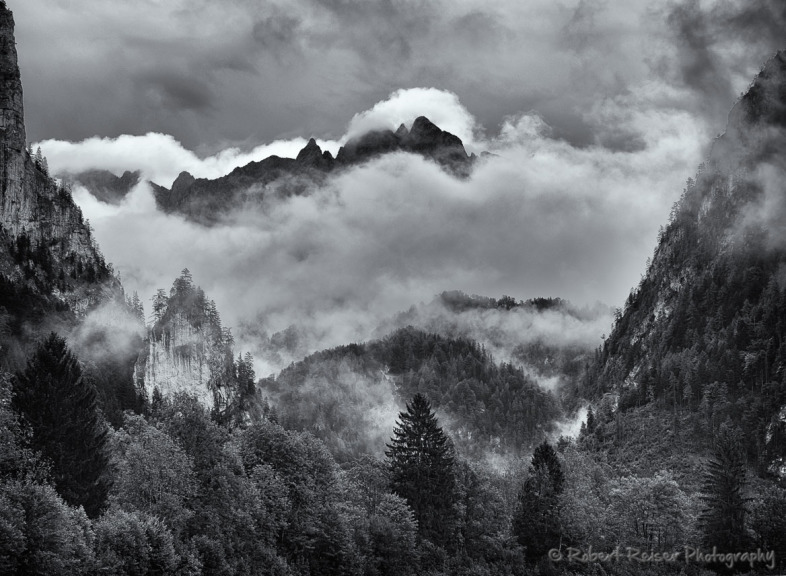 I took this picture on a weekend workshop in Nationalpark Gesäuse, on a rather dull day. We stopped at one of the known locations for this specific scene, which marks the entrance to the “Gesäuse” area. The name originates from the noise created by the river Enns, which rushes through the Gesäuse area. We got out of the car and… we were immediately disappointed with the scene. Clouds everywhere, covering most of the mountains – really nothing worth taking a picture of. Knowing that the weather in that area can change quite quickly, we decided to stay for a bit longer. An eventually, you were able to see some peaks and mountains through the clouds. This was the time when I took this and some other shots. Still, if you look at the raw files, it was mostly boring shades of grey. So it was an easy choice to convert the picture to Black and White. I opened my favorite software for Black and White conversions, Nik Silver Efex, and started playing around with the various contrast settings. A significant increase of the midtone contrast helped the picture a lot, and the drama in the clouds became much more prominent. After a little bit of additional fine-tuning, “Gesaeuseeingang” was ready and I submitted the picture to the competition.